Today it's hard to realize just how popular Charlie Chaplin was back in the heyday of silent films. There is no current equivalent and the magnitude of his fame has never really been equaled since. Chaplin's Tramp character was a world-wide sensation since his films were easily exported to non-English speaking countries. His movies were in such high demand that scores of Chaplin imitators emerged, there were Chaplin imitation contests, he was the first actor to be featured on the cover of Time Magazine, and he was one of the highest paid people (of any profession) in the country in the teens. His films are still immensely popular today and the last time I saw a Chaplin film on the big screen, it sold out the theater where it was showing. 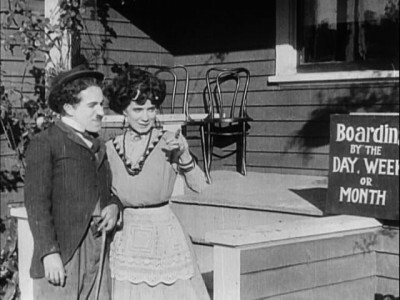 Yet with all of that popularity, the earliest Chaplin films have not been available on DVD... until now. The great people at Flicker Alley have released Chaplin at Keystone, a fantastic four disc boxed set that collects 34 of the filmmaker earliest effort. Not only that, but all of the films have been restored, are accompanied by music from the top silent film musicians around, and come with an informative 40-page book by film historian Jeffrey Vance. This is a set than needs to be in any comprehensive library of silent film. Background: Charles Spenser Chaplin was born in London in April of 1889. His parents both toured the British music halls and had acts of their own. His father left the family when he was young (without divorcing his mother) and went on to have a good carrier on the stage. His mother, Hannah, on the other hand started suffering from mental illness and her venues soon started shrinking. As legend has it, one night when Charlie was five his mother entered the theater too ill (or drunk) to go on. He went on in her place and started singing one of her songs. The audience was so enchanted with the precocious little singer that they started throwing coins on the stage. Charlie stopped in mid-song and started scurrying around the stage collecting all the money. Suddenly remembering his audience, Chaplin stood up and said "Wait till I get it all, and then I'll sing a lot!" This brought roars of laughter and more coins. He made three pounds in tips that night, a huge amount in those days. Hannah continued to deteriorate, and it soon got so bad that she could no longer work. The two of them, along with Charlie's older half brother Sydney, lived in squalid conditions in various locations around London. Eventually, Hannah was admitted to a mental institution and Charlie and Syd were taken to the Hanwell School for Orphans and Destitute Children, a strict institution were children were hit with a birch rod for the smallest infractions. They were to spend eighteen months there before their mother was well enough to retrieve them. Chaplin would later refer to this time as his "incarceration." When he was eight, Charlie's father got him a job with a traveling troupe of children clog dancers. Clogging was the rage at the time, and Charlie toured the UK with his group, The Eight Lancashire Lads, but after a year or so he was let go. Chaplin then took odd jobs where he could find them, and occasionally attended school. As time went by, Charlie and his brother Syd tried to break into show business on several different occasions with some success. Charlie attained a certain amount of fame in various plays as a child, but when he got older he found work hard to come by. Syd in the meanwhile was an up and coming comedian, and was eventually taken on by Fred Karno's troupe. Fred Karno was the leading producer of comic plays for music halls at the time. He turned the art of comedy into a science, creating a 'fun factory' where young actors would train and study and then he would send them out on the road when they were ready. At any one time, Karno would have between six and ten troupes out touring. Syd did well under Karno, and he convinced Fred to give his brother Charlie a try. 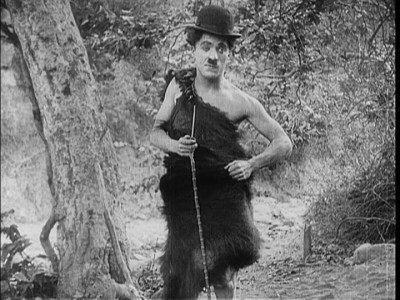 Chaplin worked hard studying comic techniques, and rose quickly through the ranks. He was the headliner during the Karno's 1910 tour of America. (Stan Laurel was also on the same tour.) Charlie was a huge hit with the American audiences. The demand for tickets was so high that the theater manager in Seattle wanted the group to perform five shows a night. Chaplin refused and even told the manager himself. Such success naturally brings the attention of Hollywood, and Charlie was recruited by Mac Sennett's Keystone Films who signed him in 1913 at $150 a week. Keystone: Charlie wasn't sure what to make of Keystone at first. The company had to produce a new two-reel comedy each and every week, and the pace was frantic. Charlie didn't like the pace or the comedy. He wanted to do more refined slapstick. He didn't feel that every short had to end with a chase, and wanted longer shots instead of the rapid cutting that Sennett employed. Chaplin argued with the directors. He was upset that they would dismissed his suggestions for the films on the grounds that they didn't have time for an elaborate set-up. Chaplin had the philosophy that making one funny film was better than making many mediocre ones. He would follow that philosophy for the rest of his career. As his tenure at Keystone went on, Chaplin's movies became more and more popular. Fairly soon his films started outselling all the other Keystone shorts. With this success Chaplin was able to exert more control on his movies, which led to higher quality films and even bigger demand. Soon he was writing and directing all of his pictures. When his contract was up, Chaplin was a star and wanted a star's salary. Keystone couldn't meet his price, so he signed a one year contract with Essanay for an astounding $1250 a week. The Keystone films are not as polished and carefully constructed as Chaplin's later masterpieces would be, but that's understandable given the system that Sennett used to churn out an impressive number of films each month. Yet it was during his time with Keystone that Chaplin learned the art of filmmaking. He discovered what worked, how to set up a gag, and created the character that would make him the most recognized man in the world. This collection of Keystone movies are important because they show Chaplin evolving as a screen comic. Not only that, but this collection chronicles the early Tramp character and how Chaplin tried out different personas until he hit upon the right combination traits. This collection includes some excellent and historically important movies. It starts out with his very first movie, Making a Living, where Chaplin plays a con artist who tries to steal away a man's money, girl, and even his job. It is an interesting effort that shows glimpses of the genius to come. The most famous movie that Chaplin made while at Keystone has to be Kid Auto Races at Venice, Cal. It's only six and a half minutes long, and not really all that funny, but it features the first appearance of The Tramp on film. The crew basically went out to the event and filmed without a script. They just put Chaplin in front of the camera and let him do his thing. Though he looks like he would in The Circus and City Lights, the character itself is very different. Another interesting early film is Tango Tangles, an all-star Keystone film directed by Mack Sennett. This film features all of Keystone's biggest stars, Ford Sterling, Roscoe Arbuckle, Chester Conklin, and, of course Charlie Chaplin (curiously, Sennett's other star, Mabel Normand, is not in this picture). 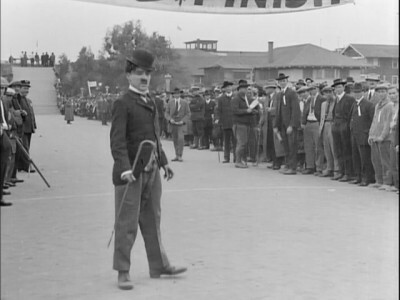 It had been a little over a month since Making a Living had been filmed, and less than two weeks since the earlier film had been released, and Chaplin was already one of the studios star performers. He gets a large role in this funny film about musicians and a drunken dandy who are fighting over the hat check girl. What's even more interesting is that Chaplin is not in a costume or with a lot of make up effects. The film shows him as he looked at the time, very attractive and athletic. It's easy to see why he had no trouble talking young women into bed. I'm very pleased that all six films where Chaplin appears with Roscoe Arbuckle are included (the previously mentioned Tango Tangles, His Favorite Pastime, The Knockout, The Masquerader, His New Profession, and The Rounders). The two don't interact in the first five to any real extent, but in their final pairing, The Rounders, the two extraordinary comics costar together and it's a wonderful event. Chaplin and Arbuckle are two drunkards who live across the hall from each other. They come home one evening, soused, and get an earful from their spouses. The wives yell at their husbands and then eventually start in on each other. This gives the boys a chance to sneak some money from their better halves purses, so they can continue carousing. 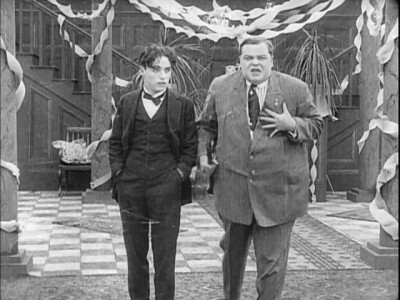 Chaplin and Arbuckle play expertly off each other with great comic effect. Their acrobatic stunts are more than just prat falls, more like a ballet as the two twirl around each other (and their wives) and stagger in unison. You can tell that more thought went into this short than the average Keystone picture. Chaplin and Arbuckle both wanted to do more sophisticated humor, but with this picture they proved that they could do slapstick better than anyone else at the time. There are several films with Mabel Normand in the collection too, which is a treat for fans of the tragic comedienne. (Mabel's Strange Predicament, Mabel at the Wheel, Caught in a Cabinet, The Fatal Mallet (which also costars Mack Sennett), His Friend the Bandit, Mabel's Busy Day, His Trysting Places, and Mabel's Married Life). 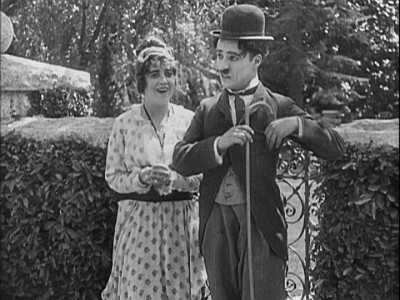 These weren't the highlights of the collection, and I never really felt that Mabel Normand and Charlie Chaplin were as good paired together as they were by themselves or teamed with other actors. Their styles were too different, and they never really meshed well on screen. Still, it was a treat seeing these rare films. Some of the other highlights in this collection include Dough and Dynamite, a hilarious film with Chester Conklin. Chaplin and Conklin are waiters who have to step into the kitchen when the cooks go on strike. One of the strikers has placed a stick of dynamite in an uncooked loaf of bread, which Chaplin sticks in the oven. One of the most popular Keystone films of that year, it cost $1800 to make and grossed $130.000. Not a bad return for a hilarious movie. His Trysting Places is a unique Chaplin film in which he's mean to a child, with comic results. I especially enjoyed when he let the toddler play with a real gun. The set concludes with another important Keystone movie, the first feature-length comedy, Tillie's Punctured Romance. Made as a vehicle for stage actress Marie Dressler, the film doesn't play as well today as the more famous features from Harold Lloyd, Buster Keaton, or Chaplin himself, but is still plenty of fun. Chaplin is a city slicker who convinced country bumpkin Tillie (played by Dressler) to run off to the city with him and her father's money. Once there, Chaplin ditches poor Millie for another girl (played by Mabel Normand) until he discovers that Tillie is the heir to a fortune. Normand is very good in the film, while Dressler is obviously not comfortable with the new medium of film. Chaplin however steals many of the scenes and really shines, even if his character is a far cry from the one that he would soon be immortalized for creating. It's a slapstick film, and the constant gags work more often than they fail, making this a fine offering. These 34 films come of 4 DVDs, each in its own thinpak case and housed in a slipcase. These films all boast new scores by some of the new crop of silent film accompanists. Notables such as Stephen Horne, Neil Brand, Eric Beheim, and my personal favorites Rodney Sauer and the Mont Alto Motion Picture Orchestra wrote/compiled and played wonderful scene-specific scores for these films. The music really enhances the viewing experience tremendously. Bravo to Flicker Alley to going to the extra expense to get top tier musicians to play along with these films. If anyone isn't sure if the music makes a big difference, compare this set with the music to the recent Fantomas five film collection. It really is astounding how much more enjoyable silent move are with appropriate music. These films have been restored from elements housed in film archives from all around the world. Both positive and negative prints were used sometimes of varying gauges. Because of that the image quality varies from film to film, and sometimes from scene to scene. Overall the result is very impressive however and I can't imagine anyone not being pleased with the results. I've seen at least parts of Kid Auto Races at Venice, Cal. on several occasions, but when it came up on this set I let out a gasp. It was amazingly clean and clear, a much better presentation than I'd ever seen before. That's not to say all of the films came out that wonderfully, there's only so much restoration can do. Some of the films are scratchy and other have contrast issues, but in general the films look very good. The set comes with some nice extras. First off is the 40-page book by Jeffrey Vance. He lists all of the movies, one by one, and includes such information as the filming dates, release date, director, etc. There's also a nice synopsis and notes to go along with the each film as well and a nice overview of Chaplin's time at Keystone. Video extras include a six-minute except from the recently discovered Ford Sterling comedy A Thief Catcher where Chaplin plays a Keystone Cop. There's a cartoon featuring an animated Chaplin, Charlie's White Elephant, and a look at what it took to create this DVD set, Inside the Keystone Project. Finally the set is wrapped up with Silent Traces, a 12-minute look at what some to of LA locations that Keystone used look like today and a photo gallery. These were all fun to watch, especially the first two, and added a lot to the set. This is a wonderful set. Even the shorts that don't work as well (mainly the earlier ones collected here) are still fun to watch. Chaplin is always interesting when he's on the screen and even a lesser comedy becomes an enjoyable event when he stars. From an entertainment standpoint is great, but as a historical chronicling of an early film genius as well as the evolution of movie comedy it's irreplaceable. A Highly Recommended set.